Last week I made the most delicious Hete Bliksem, which translates literally as Hot Lightening. Normally we make this with potatoes, apples and some bouillon, but I've been making it with celery root in an effort to eat Primal (Paleo). 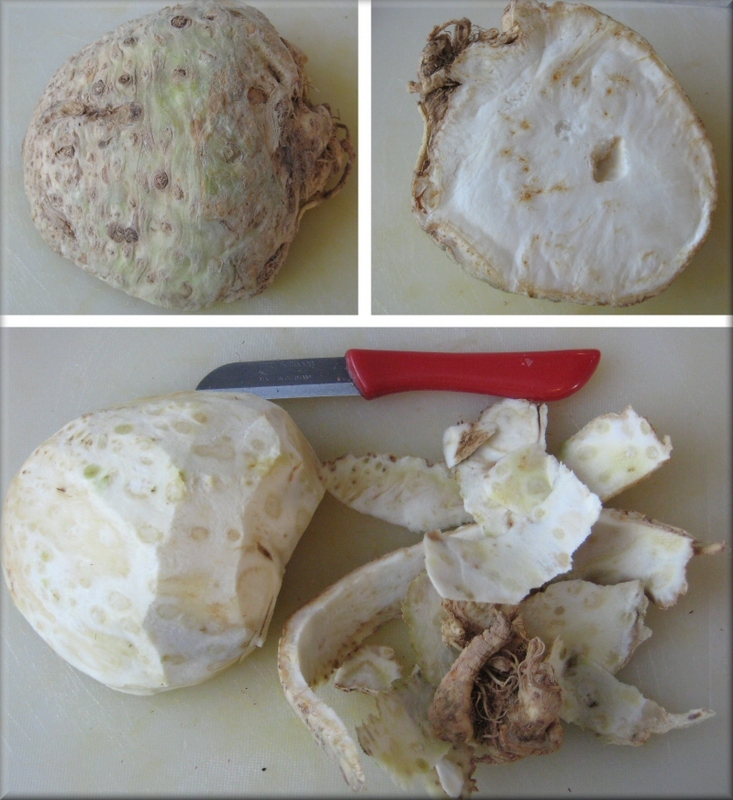 It tastes really good with celery root, too. So, I made the Hete Bliksem and served it together with Oostere Spek (Eastern as in Asian Pork) which is one of our favorite meals. And all through the meal Mark was exclaiming his love for the meal! And I was, too. Love it! But I didn't want to eat it again so soon, so I stored up the leftovers* in the freezer to save for the following week. Then, in the meantime, Mark eats some spoiled meat (little pork sausages) that he'd been carrying around all week long (supposed to be refrigerated after opening) and then he gets sick on his birthday. And he takes a while to recover from food poisoning. And then he goes and associates my delicious meal with his food poisoning stomach flu and now... he doesn't want to eat Hete Bliksem or Pork. Aye Caramba! But, it's been a week since said incidence so I get the Hete Bliksem out of the freezer and warm it up for the nights planned pork dinner. This time I served it together with pork chops instead of spek. And he just can't stomach it. Well, it's too much food for me to eat. What am I gonna do? I don't want to freeze it again. So, I think, I'll try and use it up in the morning. That's just what I did and it was fantastic! For a single portion - for myself, I baked three strips of bacon. Ate one slice, gave the other slice away, and crumbled the third slice. Then I beat one egg, added the crumbled bacon to it, some fresh snipped green onion and two spoonfuls of leftover Hete Bliksem. Fried it in the frying pan with a little olive oil or butter and whalaa: the most delicious leftover breakfast hash... very satisfying and tasty, too. Season with salt to taste. Now, in case you are wondering what Hete Bliksem is? It's like mashed potatoes but better! You boil in a pot one celery root, peeled and chopped up together with about 600 grams of peeled and cubed apples. Cover with water. Add a chicken or beef bouillon block and cook until soft. Then drain the water and mash. That's it. Serves 4-6. It's great served with pork for a main meal. I like it best with spek. This is how we bake the spek - eastern style. Add a little olive oil to the pan and cook speklapjes* (4-6 slices) until brown on both sides, then add a finely chopped onion and 1 tablespoon sweet soy sauce (ketjap manis) and cook a further 5-10 minutes until onions are soft. Serve with Hete Bliksem and extra jus. Yum Yum. Hete Bliksem, Oostere Spek en jus. *I've talked to the butcher here to ask what spek is in English and he doesn't really know. Neither do I. I've not really seen this cut of pork in the U.S. It's probably more common if you go to an Asian market as I had a Korean guest for dinner a while back and she said it was something they ate a lot in Korea. So, spek looks like a fat piece of bacon. But the butcher said that bacon is a different cut of meat from the pig - that spek comes from the belly of the pig. That's about all I can tell you about it. So, it looks like a fat piece of bacon and it does take quite a while to cook - like 15-20 minutes... it is so yummy - I highly recommend it to all my American comrades. 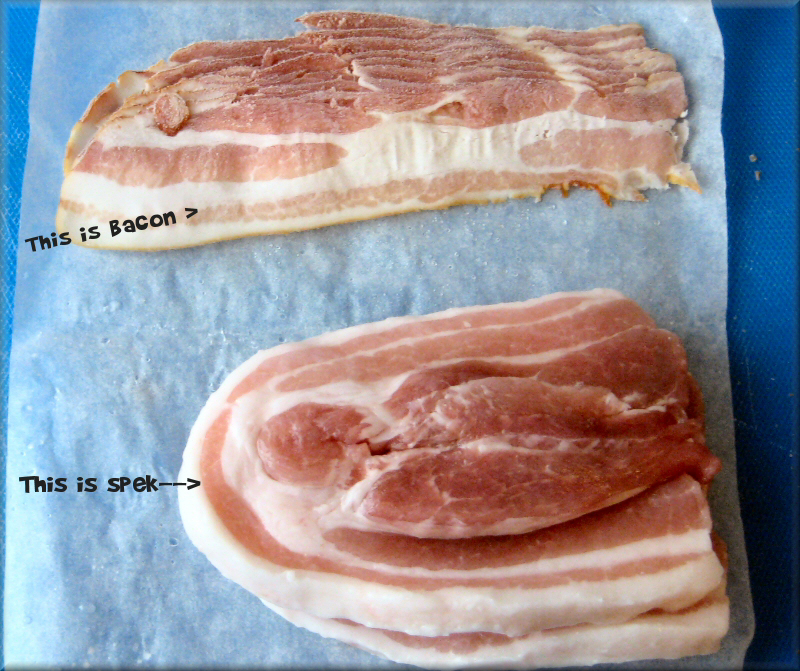 comparison: there are several slices of bacon, and only two slices of spek. Spek is much thicker. *Update: So a friend of mine just sent me this: pork belly So, go to your butcher and tell him that is what you want!! !